The following article is written by Ellen Delap, she is a lady who I am working with in trying to get my office space, and other areas organized in my world. I work full time, and run CopyKat, and try to have some semblance of a normal life. Sometimes this works out, sometimes things get quickly out of control. Here are some of Ellen’s tips on organizing your pantry. Want to get excited about making dinner? Need a simple, go to spot for dinner prep? Want to see everyone in your family get excited too? 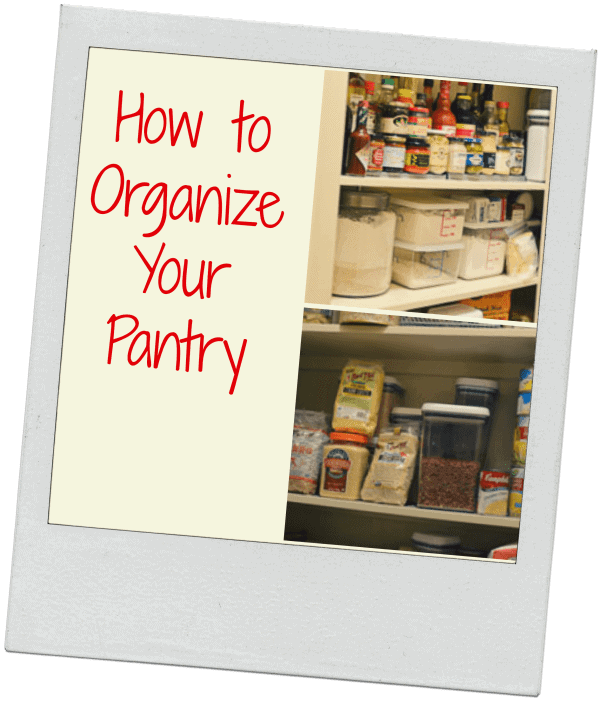 Then it’s time to organize your pantry! An organized pantry is the spot that will save time and money, as well as reduce stress (especially at 5pm!) The pantry can be stocked with items on sale for nightly dinner, parties, and emergency situations too. Use these effortless steps to organize your pantry. · Set aside two hours to get this job done. Start at one side, top shelf, and work across and down. Decide what to keep, donate or toss. Keep only what is good, tossing out of date foods. If you have an abundance of unopened items, consider donating these to one of our local food pantries. · If there are small appliances in the pantry, review how frequently you use them. You may prefer to store these in another area of your kitchen for extra pantry space. Again, if you have not used these items, donate these for clutter control. · Place the items in different categories depending on how you use them. If you use all canned items together, subcategorize by veggies, fruits, and meats. Categorize groups together. This can be pasta, baking products, beverages, breakfast, lunch and snacks. You may want to create a category to keep all the coffee and tea products together with the sweeteners over by the coffee maker instead. · Now your pantry is completely empty! To refill it, start by assessing the space depending on what foods you use most, and who needs access to what! If you have small children, create a snack or breakfast area on the bottom shelf. If you eat pasta every other night, then pasta should be placed on the center shelf at eye level. Continue to refill the pantry by deciding which foods you eat most and finally by which you eat least. · Keep the floor as clear as possible. Only use this space if you can tuck items under the bottom shelf safely. Easy entry into your pantry keeps it organized. · If you find “white space” with unused vertical area above items, consider a trip to your local retail shop or online venue. Using a stacking shelf, double tiered turntables, expandable shelf, or under shelf basket, adds volumes to your space! Also, think of easy access to boxes and containers. Taking packets out of a box and placing these in an open basket make them easier to use. Use square containers to hold floppy items and make best use of the corners of the pantry. Finally, want to keep this space well organized? Use a label maker and place labels on the shelves for your items. Everyone in your home will know where to find items and they will be able to assist with putting away the groceries and replacing them after use. You can view what to add to the grocery list simply by recognizing the empty shelf space too! A well organized pantry is a thing of beauty! A well fed family, a happy hostess at party time and knowledge of emergency rations are a wonderful reward for your hard work! For over 10 years, Certified Professional Organizer and Certified Family Manager Coach, Ellen Delap has helped her clients make time and space for what’s important to them by organizing their homes, offices and their daily living. Ellen, owner of Professional-Organizer.com, works one on one with her clients in their home and offices streamlining their environment, creating effective strategies for an organized lifestyle and prioritizing organization in their daily routine. She specializes in working with ADD and ADHD families, adults and students. Ellen has been featured on Stretch Your Dollar on ABC13 Houston, in articles in the Houston Chronicle, a guest speaker on radio KLOVE, and is a national expert on The Clutter Diet, an online organizing website. She is a Golden Circle member of the National Association of Professional Organizers and a specialist in chronic disorganization and ADHD with the Institute of Challenging Disorganization. Learn more about her and her business at www.professional-organizer.com, Twitter @TexasOrganizer, Facebook business pageEllenDelapProfessionalOrganizer and Pinterest Ellen Delap.